Dog friendly destinations, stuff for dogs, and advice for dog owners. Hi guys, I'm partnering with Lexus and A Girls Guide to Cars to help promote pet safety and would love it if you guys joined me at Lexus of Carlsbad on Sunday, Nov 4. We're going to be taking a look at some new Lexus models including the Lexus ES, LS, and RX as well as talking about ways to keep your pets safe while traveling. Oh and we even have a giveaway going on right now, so make sure to check that out in the article below! Wine lovers will find that a stay at the Bernardus Lodge will warm their hearts in a special way. It's a fabulous property surrounded by vineyards and horse ranches but still close enough to the Bay Area that it makes for an easy weekend getaway. For those who have never visited, Carmel Valley is a true hidden gem. The area is sometimes overshadowed by other California wine regions and missed by travelers seeking golf in Pebble Beach or beaches in Carmel-by-the-Sea. However, for those that do visit, they are in for a fabulous experience that you will dream of going back to. As you know, I travel constantly and I can see that it takes a toll on Niki Belle as much as it does for Heather when I leave for a few days. Over the past few years though, I've come up with a few different ways to make it easier on her when I leave and you should be able to apply this advice for your dog or other pets too. This is especially important when both of us travel and leave her at home with a pet sitter. It is important as an owner of a dog that you are aware of the problems that your breed may experience at one point in its life. Whether you have already adopted a dog or you are thinking about it and want to know more about the various breeds, you will want to educate yourself regarding the various health concerns that they could end up with and the treatments that may be available to help. Aside from the destination itself, deciding where to stay is probably the most important thing to determine. Typically for me this has ended up being a hotel room or a resort villa but another great solution for a group is a vacation rental such as the one we stayed in on Anna Maria Island, Beachy Villa Vista provided to us by Island Real Estate. Portland, Oregon is a city that I've wanted to visit for quite a while but just never seems to work out for a visit. However, the folks at River's Edge Hotel invited Heather and I to spend the night there on our way back home and so I figured that was kismet. While some destinations might prove to be a challenge to visit with Niki, Portland was a fantastic dog friendly getaway with great food and friendly people. In fact, my only regret is that we couldn't stay in Portland longer. It's no mystery why I love my Niki Belle - she's my dog and we've had some great adventures. I was fortunate that she loves car rides and enjoys exploring as much (maybe even more so!) than Heather and I.
Miramonte Resort and Spa is located about half way between Los Angeles and San Diego in the Coachella Valley about 30 minutes south east of Palm Springs. It is in the perfect location for anyone who can't decide if they want an active weekend getaway or one with breakfast in bed followed by relaxing by the pool topped with a relaxing visit to the spa. The simple answer here is you can have both... and it's very pet friendly, so there's no reason to leave your dog at home! At first glance, Las Vegas isn't the most dog friendly destination. It's a city teeming with people and mega resort hotels with seemingly endless hallways that let's face it... your dog might not make it down before they have an accident. 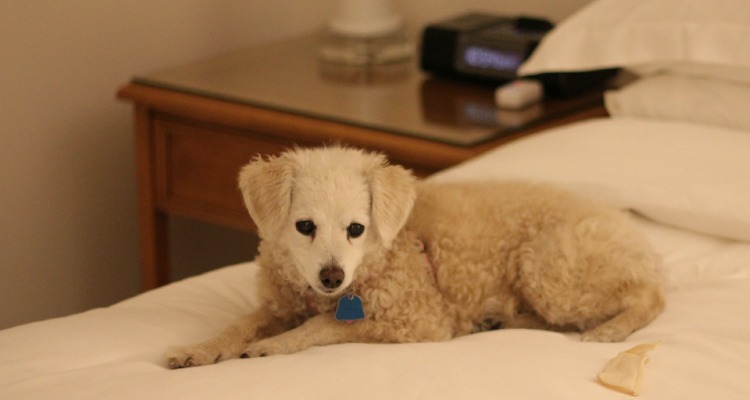 Luckily for those of us who love to travel with our dogs, some Vegas hotels are starting to work to accommodate dogs and some even welcome them with open arms like we discovered while visiting Delano where we received a media rate and free concierge services for Niki Belle. I love "of the month" gift boxes, it's a fun way to get new and interesting stuff each month but honestly "I" don't need more stuff. Niki Bell though on the other hand sometimes gets left out and so when Truly Pawsome contacted us the other day offering to send her a birthday present I was super excited to FINALLY have a package that was actually for her. Personally, I LOVE grains in all forms - beer, bread, cereals etc. but for many people gluten intolerance, it is a major issue. What we don’t think about all the time is that our dogs can have food intolerances too and that goes for things like grains, soy, and wheat - all of which can affect their bodies in similar ways as it does to our own. So that’s why I was interested in checking out WholeHearted, a new dog food that can be found exclusively at Petco. When planning your next beach vacation, you might have your heart set on a hotel by the water but here's an alternative - Staybridge Suites. During our #MenWhoBlog trip earlier this year, we stayed here and it was the perfect home base for an awesome guys getaway in Torrance, California. To many people, the desert is an inhospitable wasteland but to me it is an open canvas just waiting to be explored. Lucky for me, this romantic ideal is shared by others as well! For many years, vacationers have made the journey to the desert so they can bake in the hot dry sun and relax in the pool, play golf, and generally escape reality for a few days. With La Casa Del Zorro, Heather and I had the chance to spend four nights at the resort with the first two being just us (and Niki Belle) in one of their casitas with a private pool. This hotel was booked for us by Visit Santa Fe. One of the things that I love to see is when older properties are renovated - rather than simply leveled to create something with a cookie-cutter design conceived of without any regard for the community. It shouldn't be a surprise that this was the path that the owners of the Santa Fe Sage Inn took, considering the dynamic and unique nature of Santa Fe itself. What on the outside looks like an older motel, has been lovingly restored and updated with a low-frills but comfortable and inviting decor matching the vibe of the town. Las Vegas may be the king for people all around the world, but there's another city in Nevada that is the Prince... or at least the Duke. While Las Vegas has virtually no redeeming qualities outside of being hot as hell, Reno is located close enough to the ski resorts around Lake Tahoe and a major airport that this could be your basecamp to launch an awesome Reno / Tahoe mancation adventure. South Lake Tahoe is an interesting mixture of high-rise casino resorts, modern ski condos in the Heavenly Village, and old independent motels. There's a relatively new player in the market now and that's Basecamp Hotel. The hotel has taken over the bones of a classic motel, renovated the crap out of it and has even built some all-new buildings too. It's an interesting boutique hotel that somehow actually creates the feeling that you're part of a community when you stay there. Visitors to Coronado Island are typically familiar with the famous Hotel Del - afterall, it's one of the earliest buildings in the area and set the tone for the next 100+ years as a mecca for beachgoers. What I learned this week, was that just across the road is an even older building that was built a year earlier in 1887. Originally serving as the boathouse for the resort, it now houses a fantastic seafood restaurant that is part of the Bluewater Grill group. There are many ways to add a new furry member to your family. From pet shops to breeders to ads in the paper, but when you consider all the options, adopting online is probably one of the best choices you can make. About 10 years ago, that's how Niki Belle came into our lives. We fell in love with her from an ad we saw in the online classified section and quickly raced to the home where she was to get her. It's been one of the best decisions that we've made. My wife and I don't have kids - so our dog, Niki Belle, is our fur baby and child in probably more ways than a couple in a similar position might understand. When we first got her, we nervously prayed that she would be ok with doing road trips and were blessed that she indeed did not get car sick and was happy to curl up and relax or sit and look out the window. As anyone knows though, that's only part of the equation when it comes to taking care of your dog on the road.